Drew returns from the brutal disappointment of so-called "paradise" in Ireland and confronts a whole new challenge: a thousand-mile journey across infected America. 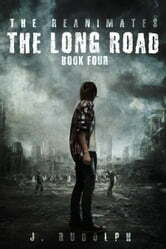 Can he survive the zombie apocalypse and save the last of his people? Now, having returned to America, Drew must fight his way across a fatally-infected New York and the remains of civilization itself to find and warn the last of his people: Don't go. There is no escape to Ireland. Their hell is worse than ours. The Long Road is two stories in one: Drew's travels to Montana to save the last people in the world that matter, punctuated by the vivid, violent memories of Ireland and what humans can do to each other when the world collapses around them. All is not lost, but Drew brings with him a bitter message: When your last hope is stolen from you … it's time to build hope, all your own.